Pachinko is popular throughout Japan and while some of the parlors have ultra-modern architecture and look more like Las Vegas casinos, some still are the old variety that employ more “traditional” styles. 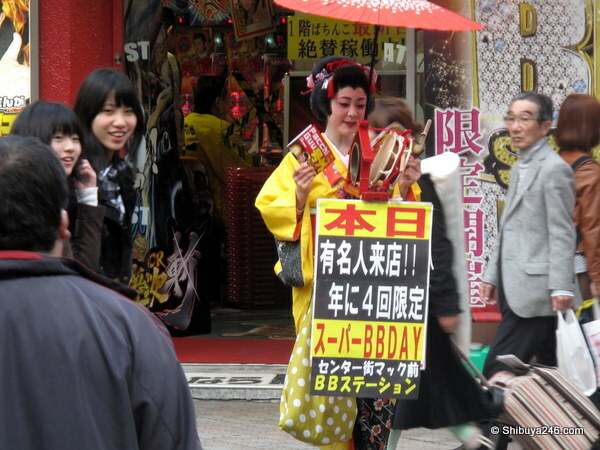 Here is a street performer hired by the Pachinko Hall in Shibuya’s Center-gai to advertise their store. The sign says “Today, Famous person in store, only 4 times a year event”, and beneath that “Super BB Day – Center-gai, in front of McDonalds”. This is not the typical face of Japan, but it is not exactly out of the ordinary either. Nice one. Did you try Pachinko also? She was hard to miss! I looked back through my photos to see if you were hiding in the corner and had been cropped out, but unless you were dressed in a kimono holding a red kasa, I don’t think I got you in the shot.